Find a great sellection of wheels here. Find "Wheel collars" as a sub-catagory of "Hardware". As pictured in lower left corner. The Ultra Light wheels feature a hard plastic rim/tire combination. Available in other sizes: 38mm; 51mm; 76mm; 102mm; see next listings. May come in white or black color. Look great if you color the white tires black with magic marker. Tougher than the O-ring (Shock Absorbing) style (pictured in upper right corner). 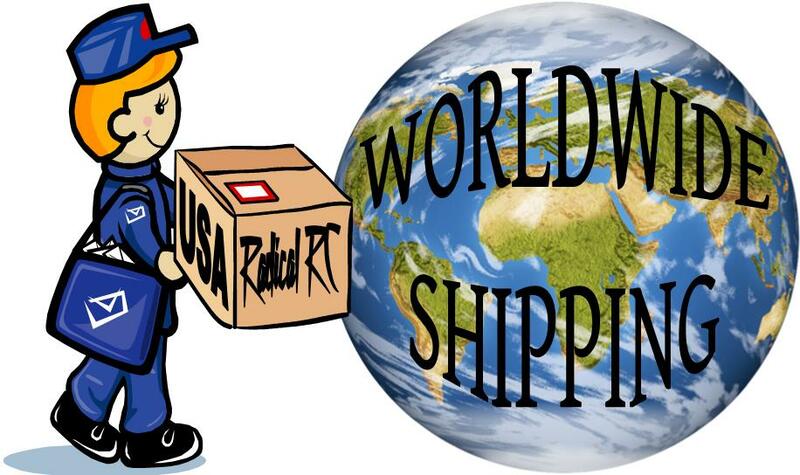 Generally used for models 14 oz or less, best 12oz or less. GWS light weight foam tires on plastic spoked weels. 1.5" diameter. Resistant to flat-spotting. Weight per pair=3.3g/0.12oz. Priced per pair. 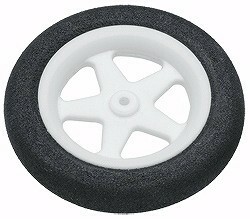 GWS Light Foam Wheels 2"
2 per package, light weight weels syuitable for many park flyers and indoor models. Strong hub. Light weight lathe turned, aluminum wheel set with hard rubber tires. We use these on our Micro Bipe, Micro Stick and Mini Sticks. Weight per 3 wheels=0.19oz. Priced per set of 3: 2 main wheels and one tail wheel. 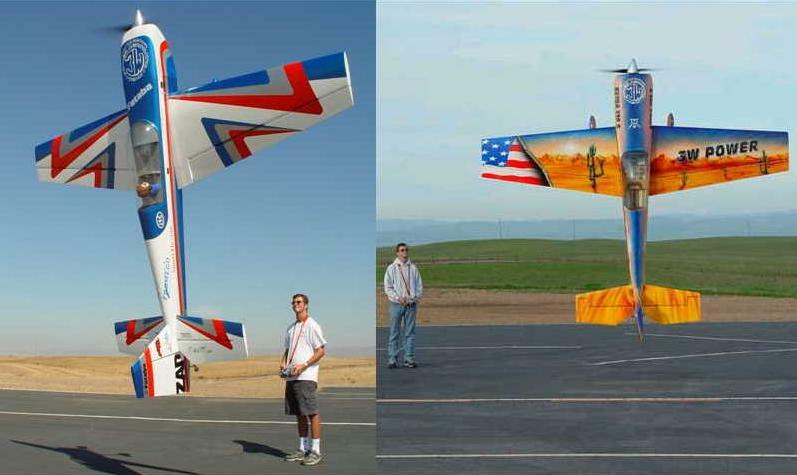 OD of tail wheel = 1/2". 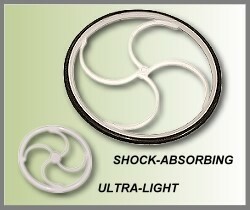 Du-Bro Micro Lite Wheels are available in 3 sizes: 1 1/2"(38mm); 2"(51mm) = 2.9g/.10oz; 2 1.2"(64mm); all sizes shown. See next listing for larger size. One piece, spoked wheel in flat black. No o-rings to come off rim. Comes 1 pair/pack includes 4 wheel retainers. .032" axle through hole in all sizes. Perfect for indoor and park flyers! Du-Bro Micro Lite Wheels are available in 3 sizes: 1 1/2"(38mm); 2"(51mm)=2.9g/.10oz; 2 1.2"(64mm); all sizes shown, see previous listings for smaller size. One piece, spoked wheel in flat black. No o-rings to come off rim. Comes 1 pair/pack includes 4 wheel retainers. .032" axle through hole in all sizes. Perfect for indoor and park flyers! Du-Bro Mini Lite Wheels are available in 3 sizes shown: 1"(25mm); 1 1/4"(32mm); 1 1/2"(38mm). See next listing for larger size. Two piece press together hub and super light foam tire. Comes 1 pair/pack .047" axle through hole in all sizes. Perfect for indoor and park flyers! Du-Bro Mini Lite Wheels are available in 3 sizes shown: 1"(25mm); 1 1/4"(32mm); 1 1/2"(38mm). See previous or next listing for other sizes. Two piece press together hub and super light foam tire. Comes 1 pair/pack .047" axle through hole in all sizes. Perfect for indoor and park flyers! 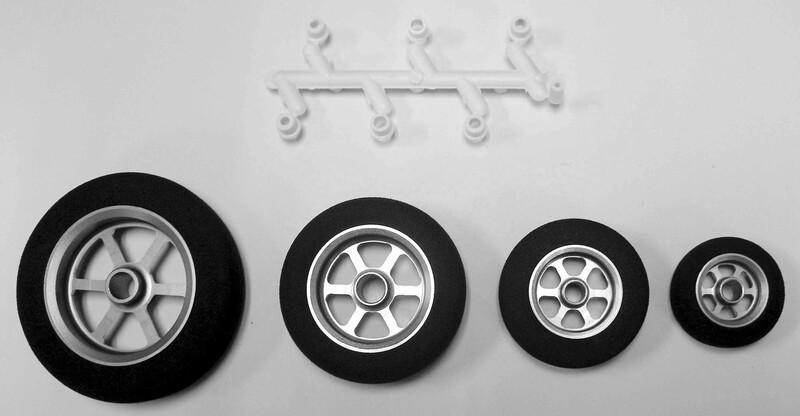 Du-Bro Mini Lite Wheels are available in 3 sizes shown: 1"(25mm); 1 1/4"(32mm); 1 1/2"(38mm). See previous listings for smaller sizes. Two piece press together hub and super light foam tire. Comes 1 pair/pack .047" axle through hole in all sizes. Perfect for indoor and park flyers! NEW Du-Bro Micro Tail Wheels are available in two sizes, 3/8" & 1/2". Both sizes come complete with tail wheels (2), and Micro Wheel Retainers (4) per package. This is the larger, 1/2" size. Du-Bro Low Bounce Treaded Wheels 2"
Takes a 1/8 Axle (3mm). Can be drilled to 5/32" (4mm). 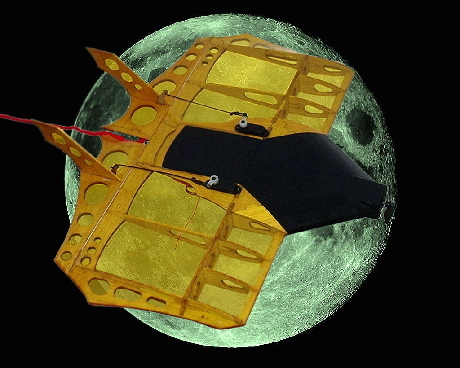 Fit inside most wheel pants and retracts. Du-Bro's low bounce captive air wheels have flown on more airplanes over the years than any other wheels on the market! The wall thickness is consistent throughout the wheel giving you a balanced tire. Comes complete with a sporty nylon metallic hub. Works well on grass & paved runways. Du-Bro Low Bounce Treaded Wheels 2.25"
Rubber wheels on plastic rim, pre-drilled for 5/32 (4mm) axles. 2.25", .800" wide, shock absorbing. Package of 2 wheels. Du-Bro Low Bounce Treaded Wheels 2 1/2"
2 1/2" Dia. x .875" width. Packed of 2 each Treaded Wheels. Takes a 5/32 Axle (4mm). Can be drilled to 3/16" (5mm). Fit inside most wheel pants and retracts. Du-Bro's low bounce captive air wheels have flown on more airplanes over the years than any other wheels on the market! The wall thickness is consistent throughout the wheel giving you a balanced tire. Comes complete with a sporty nylon metallic hub. Works well on grass & paved runways. Du-Bro Low Bounce Treaded Wheels 2-3/4"
275T takes a 5/32 Axle (4mm). Du-Bro's low bounce captive air wheels have flown on more airplanes over the years than any other wheels on the market! The wall thickness is consistent throughout the wheel giving you a balanced tire. Comes complete with a sporty nylon metallic hub. Works well on grass & paved runways. 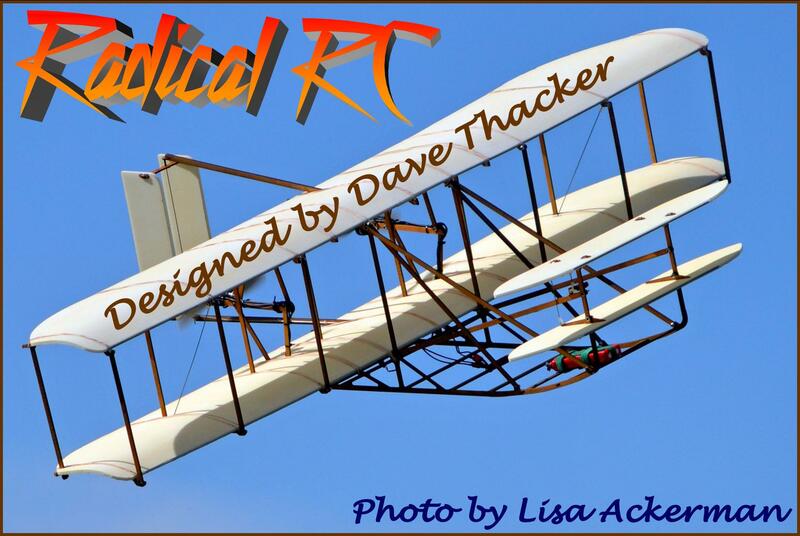 Fits most wheel pants and retract set ups. Du-Bro Low Bounce Treaded Wheels 3.25"
Rubber wheels on plastic rim, pre-drilled for 5/32 (4mm) axles. Package of 2 wheels. Rubber wheels on plastic rim, pre-drilled for 5/32 (4mm) axles. 3" Tall x 1.030" wide, shock absorbing. Package of 2 wheels. Du-Bro Low Bounce Treaded Wheels 3.5"
225R takes a 5/32 Axle (4mm). Du-Bro's low bounce captive air wheels have flown on more airplanes over the years than any other wheels on the market! The wall thickness is consistent throughout the wheel giving you a balanced tire. Comes complete with a sporty nylon metallic hub. Works well on grass & paved runways. 5/32 axles hole can be drilled to 3/16" (4.7mm). .800" (20mm) width. Package of 2 wheels. 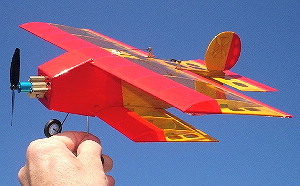 250R takes a 5/32 Axle (4mm). Du-Bro's low bounce captive air wheels have flown on more airplanes over the years than any other wheels on the market! The wall thickness is consistent throughout the wheel giving you a balanced tire. Comes complete with a sporty nylon metallic hub. Works well on grass & paved runways. 5/32 axles hole can be drilled to 3/16" (4.7mm). .925" (24mm) width. Package of 2 wheels. Du-Bro Treaded Lightweight Wheels 1-3/4"
Rubber wheels on plastic rim, pre-drilled for 1/8" (3mm) axles, can be drilled to 5/32" (4mm). 1 3/4" (45mm), .640 (16.25mm) wide, shock absorbing. Package of 2 wheels. Du-Bro Treaded Lightweight Wheels 2-1/4"
Rubber wheels on plastic rim, pre-drilled for 5/32 (4mm) axles, can be drilled to 3/16" (4.7mm). 2.25" (57mm), .780" (19.81mm) wide, shock absorbing. Package of 2 wheels. Du-Bro Treaded Lightweight Wheels 2 1/2"
Rubber wheels on plastic rim, predrilled for 5/32 (4mm) axles, can be drilled to 3/16" (4.7mm). 2.500" (64mm), .895" (22.73mm) wide, shock absorbing. Package of 2 wheels. Du-Bro Treaded Lightweight Wheels 2"
Rubber wheels on plastic rim, pre-drilled for 1/8" (3mm) axles, can be drilled to 5/32" (4mm). Package of 2 wheels. Du-Bro Treaded Lightweight Wheels 2-3/4"
Rubber wheels on plastic rim, predrilled for 5/32 (4mm) axles, can be drilled to 3/16" (4.7mm). Package of 2 wheels. Rubber wheels on plastic rim, pre-drilled for 5/32 (4mm) axles, can be drilled to 3/16" (4.7mm). Package of 2 wheels. 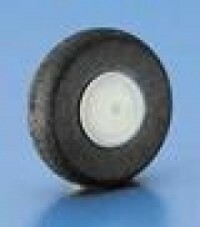 Du-Bro Treaded Lightweight Wheels 3-1/4"
Du-Bro Treaded Lightweight Wheels 3.50"
Lightweight Treaded 1/5 Scale Cub Wheels Pair by Du-Bro. 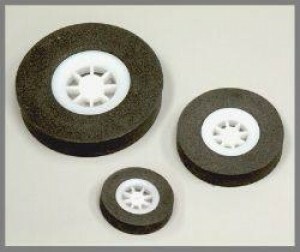 MPI 2" wheel with plastic bushings. Tire construction is 1/8" rubber layer sandwiched between light foam to maintain its shape under weight. Width .48". Weight 0.5oz. (14.2g) each. 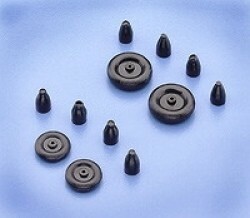 Price is per pair wit bushing assortment (3,3.5 & 4mm) easily drilled out to fit 1/8" thru 3/16". Maxx Products Lite Weight Foam Tire & Spoked Wheel Pair 1.25" Dia. Maxx Products foamie wheel/tire set. Extra tough for such light weight, resistant to flat-spotting. Great for all projects and a great weight reducer. Maxx Products Lite Weight Foam Tire & Spoked Wheel Pair 1.5" Dia. Maxx Products foamie wheel/tire set. Extra tough for such light weight, resistant to flat-spotting. Maxx Products Lite Weight Foam Tire & Spoked Wheel Pair 1.75"-2.0" Dia. Maxx Products foamie wheel/tire set. Packaging says 2", actually about 1.75". Maxx Products Lite Weight Foam Tire & Spoked Wheel Pair 2.50" Dia. Maxx Products Lite Weight Foam Tire & Spoked Wheel Pair 3" Dia. Maxx Products foamie wheel/tire set. Great for all projects and a great weight reducer. Weight 0.67oz. Axle dia 3/32", Ok to drill larger. Price is per pair. MX Super Light Wheels 1.5"
Very light weight wheel set. Weight 7.3g/0.26oz. per pair, 3.7g/0.13oz. each. Firm sponge wheel. Extra tough for such light weight, resistant to flat-spotting. Great for all projects and a great weight reducer. Price is per pair. In this size we offer a discount pack of 6 @ $8! NS Wheels: Fine, 1 3/8 X 3/16" Ultralight Spoked Wheels, Pair. NS Wheels are made in the traditional manner with 36 spokes of fine silk thread woven into balsa wood rims and tires. The hubs are aluminum tubing and together, the components produce a very lightweight, strong wheel capable of supporting an axle weight of over 1 pound. The tires are painted with Floquil paint and look more like rubber than rubber itself. NS Wheels: Fine, 3/4" Ultralight Spoked Wheels, Pair. NS Wheels: Fine, 1 1/4 X 3/16" Ultralight Spoked Wheels, Pair. NS Wheels: Fine, 1 X 3/16" Ultralight Spoked Wheels, Pair. High viz bright yellow five spoked wheels with medium density foam tires. Light weight. Indoor and park. Three sizes available, see other listings: 30mm @ 1.9g/set, 36mm @ 3.0g/set or 46mm @5.5g/set. Priced per set of two. 15mm(0.59") x .020" thick, Ultra light weight G-10 fiberglass spoked wheels. Two per set including axle keepers. Total weight per set = 0.2 grams. 20mm(0.79") x .022" thick, Ultra light weight G-10 fiberglass spoked wheels. Two per set including axle keepers. Total weight per set = 0.3 grams. Very light weight wheel set. 100mmx30mmx4mm(shaft)/ 3.9"x1.2"x.157" shaft. Weight 37g/1.3oz. per pair. Very firm sponge tires. Extra tough for such light weight, resistant to flat-spotting. Very light weight wheel set. 90mmx30mmx4mm(shaft)/ 3.5"x1.2"x.157" shaft. Weight 58g/2oz. per pair. Very firm sponge tires. Extra tough for such light weight, resistant to flat-spotting.